Sloane is your typical teenager. She has a family, she goes to school, she loves her boyfriend, and she’s not allowed to show any kinds of depressing emotion? In her world, teen suicide is an epidemic and anyone caught with slightest show of emotion is sent to the Program. Her boyfriend James and her promise to each other that they will stay strong and stay out of the program. But can promises like that are hard to keep, and when both are sent thru, the world as they knew it changes forever. Sloane is an interesting character. I think what I like the most about her is how real she was, how much she wasn’t perfect little package. She was the up and down of a regular human being. As the story progressed, so did Sloane. She began to realize certain things about herself and I really liked seeing her develop as a person. James is a darling! I really like him as a character as well. His character is one of those that I really enjoy in guys. He was the sweetest, protective boyfriend, but he was also the tough James that was needed for the story later on. I liked how Suzanne wasn’t afraid to make these characters flawed and I liked the way they came out on the other side. The relationship between these two was sweet and emotional and real. Especially toward the end of the book, after some things happened, I loved seeing these two find their way back to each other. There were other characters and aspects in the story as well that I enjoyed, but talking about each one is going to take too long. The world Suzanne created is chilly with its relativity of today. It’s not hard to image these types of outcomes right outside your door. Overall, I really enjoyed this story. Sure, parts of it were a bit slow, but that was needed in order to set up the world Sloane and James live in. 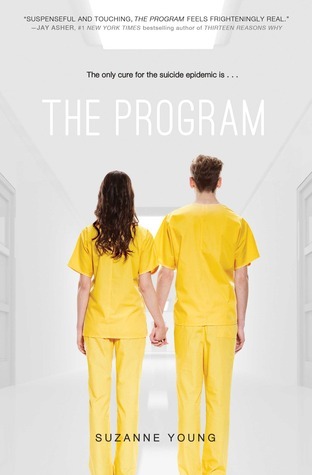 The Program was my first book by Suzanne and I can truly say I wasn’t disappointed. The Program comes out April 30th, 2013! I’d love to hear your thoughts!